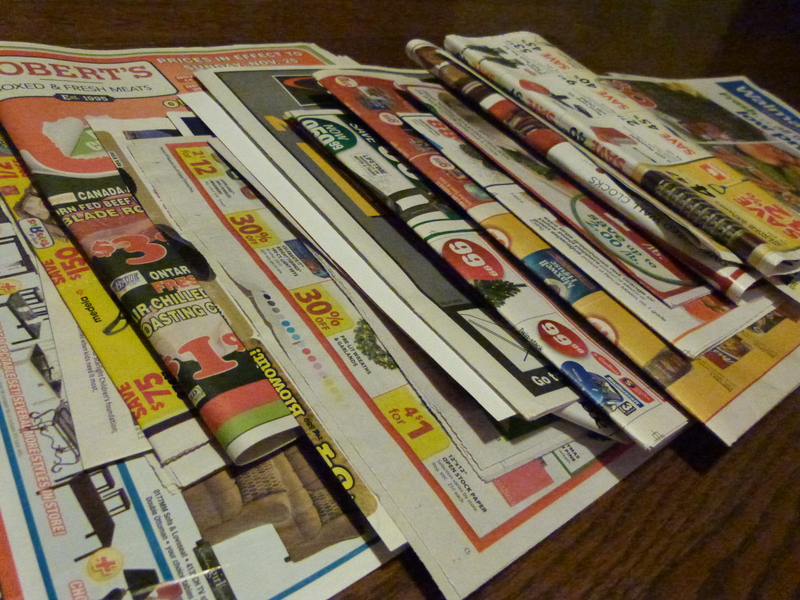 This is the first in a series of posts about how to discover the perfect Holiday newspaper craft…and fail miserably along the way. If you thought you were going to find something cute, smart and pretty here, I’m sorry that you’re about to be disappointed…unless you stick around for my future attempts which may or may not turn out to be less disappointing…we shall see. I am going to document my journey towards finding an aesthetically pleasing and easy-to-create Holiday-themed upcycled decor item. My first try went horribly wrong and I almost gave up this whole endeavour except I noticed that this could be useful for others to read about…especially if you’re like me and you like the idea of crafting, but your projects don’t always turn out magazine-ready. You need to know that you’re not alone, and it’s really ok if your folded-magazine Christmas tree is a little lopsided and the spray paint looks like it’s sliming off. * Your loved ones don’t care, nor are they judging you…even if that is what your inner voice is telling you. 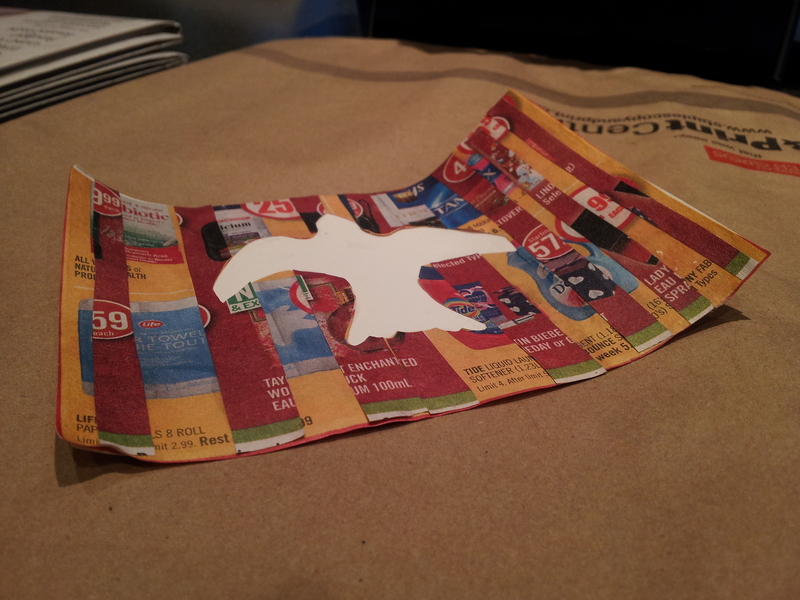 My first craft idea was to take shopping flyers, cut them up into bitty pieces and then glue those pieces into a Holiday shape on a piece of card stock. I thought I was pretty clever when I thought about using old blank cards for the card stock…simply cutting off the front piece and using the back piece as a sort of postcard. I started cutting the card into two pieces along the fold line, and this is where I received my first omen that this wasn’t going to turn out as I had envisioned. Have you tried to cut along a folded line? Yes. Does it ever work? No. So now I had a slightly imperfectly cut postcard. Not to worry…no one will notice because of the stunning card design. Omen of impending failure number two – I started gluing the cut up bits of flyer to the card, thinking that it was a really good idea to use all the Holiday inspired flyers since the colours would be just right for a Holiday card…until you add glue and all the black ink runs into the other colours. I also have a thing about getting anything sticky on my fingers…not a good mix with the glue seeping out from the edges of the flyer bits, with me trying to daintily stick everything together. Why would I choose a gluing craft if I don’t like sticky things? A very logical question that I have no answer to. The frail, end result which came from very good intentions. Not representative of my best work. At that point, I humbly put my scissors and glue away, brushed all the bits into my paper box, and called it a night. Will I allow this crafting misshap to deter me in the future? Of course not, I promised you a series of failues, so a series you’ll get! If you have any craft ideas that you’d like me to try out or profile here, post a comment or send me an email.